For several centuries there has been a traditional use of seaweeds as food in China, Japan and the Republic of Korea. As people from these countries have migrated around the world, this custom has moved with them, so that today there are many more countries where the consumption of seaweed is not unusual. Coastal dwellers in tropical climates such as Indonesia and Malaysia have also eaten fresh seaweeds, especially as salad components. In recent years there has been a strong movement in France to introduce seaweed into the European cuisine, with some success, although it is still regarded as an exotic component of the menu. It has gained more acceptance in regions like California and Hawaii, where communities of Japanese are larger and the taste for seaweeds spreads out into the surrounding population through finding them on restaurant menus and supermarket shelves. On the east coast of United States of America and Canada, around Maine, New Brunswick and Nova Scotia, some companies have begun cultivating seaweeds onshore, in tanks, specifically for human consumption, and their markets are growing, both in those two countries and with exports to Japan. Ireland and Northern Ireland are showing a renewed interest in seaweeds that were once a traditional part of the diet. Already on the market in many countries around the world are cooking books incorporating recipes using "sea vegetables". With the current trend for consumers to embrace organically grown foods and "natural" foods from clean environments, seaweeds should receive an increasing acceptance. 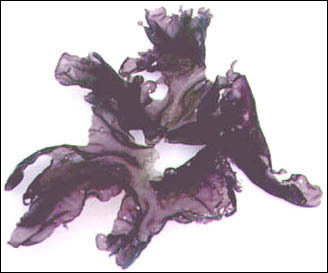 This is the purplish-black seaweed often seen wrapped around a small handful of rice in sushi. It comes largely from cultivation in Japan, the Republic of Korea and China. In Japan's list of products from marine culture, nori has the highest production, followed by oysters, yellowtails and wakame, the last being another seaweed used as food. Nori grows as a very thin, flat, reddish blade (Figure 47), and is found in most temperate intertidal zones around the world, illustrated by its history of being eaten by the indigenous peoples of northwest America and Canada, Hawaii, New Zealand and parts of the British Isles. It is among the most nutritious seaweeds, with a protein content of 30-50 percent, and about 75 percent of that is digestible. Sugars are low (0.1 percent), and the vitamin content very high, with significant amounts of Vitamins A, C, niacin and folic acid, but the shelf life of vitamin C can be short in the dried product. During processing to produce the familiar sheets of nori, most salt is washed away, so the sodium content is low. The characteristic taste of nori is caused by the large amounts of three amino acids: alanine, glutamic acid and glycine. While Porphyra can be collected by hand from natural sources, most is now derived from cultivation. Porphyra has an unusual life cycle that was not understood until the early 1950s. Until then it had been cultivated but nobody knew where the spores came from, so there was little control over the whole cultivation process. The seaweed, as we know it, sheds spores and these settle on mollusc shells: in nature it is any nearby; in cultivation they are deliberately placed beneath the blades of the seaweed. An alternate generation of filamentous algae develops from these spores and burrow into the surface of the shell; this is called the conchocelis stage. With lowered light (shorter days) and lower temperatures, more, but different, spores form from the filaments and these are allowed to settle onto nets. It is these spores that develop into the blades of Porphyra. The nets are placed in the ocean in such a way that they are exposed to air for a few hours a day (Figure 48). The Porphyra is reasonably resistant to some drying out, but the pest seaweeds that try also to grow on the nets do not survive. The nets were originally set up in intertidal flat areas, but as space became short, a new system of floating nets in deeper water was devised. The spores germinate on the nets and grow into new blades of Porphyra. For more information about the life cycle of Porphyra and the methods used to seed nets and manipulate them in the sea, descriptions with useful illustrations can be found in Oohusa (1993), Kain (1991) or Mumford and Muira (1988). For information on its nutritive value, see Nisizawa (1987) or Chapman and Chapman (1980: 108-109). For a review of the nutritional value of proteins in nori and other edible seaweeds, see Fleurence (1999). Good quality nori is in demand in the Republic of Korea, where production methods differ between the northern and southern areas. The floating system is used in the south and production costs are cheaper than in the north, where the original shallow-water pole system is used. However, the northern quality is better and it commands a higher price. Attempts have been made to cultivate Porphyra in non-Asian countries, notably the west and east coasts of United States of America. Cultivation on the west coast - Puget Sound in Washington State - was successful but became unviable commercially when residents of the shore areas objected to the presence of seaweed farms and access to sufficient space to expand the pilot farm was refused. In Maine, on the east coast, cultivation problems with indigenous species of Porphyra slowed progress, but as these were being overcome, regulatory issues between landholders and commercial fishermen again delayed progress. In the meantime, the company was reorganized, decided to develop other marine biotechnology interests and to discontinue the nori project. Distribution and marketing chain for seaweeds in Japan (after Pacific Islands Centre, Tokyo). Japanese cultivation of Porphyra yields about 400 000 wet tonne/year and this is processed into ca 10 billion nori sheets (each 20×20 cm, 3.5-4.0 g), representing an annual income of US$ 1 500 million. In the Republic of Korea, cultivation produces 270 000 wet tonnes, while China produces 210 000 wet tonnes. 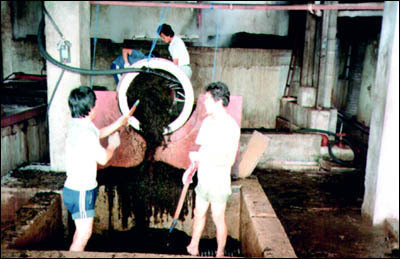 Processing of wet Porphyra into dried sheets of nori has become highly mechanized, rather like an adaptation of the paper-making process. The wet Porphyra is rinsed, chopped into small pieces and stirred in a slurry. It is then poured onto mats or frames, most of the water drains away, and the mats run through a dryer. Rate of drying is carefully controlled by adjusting conveyer speed and temperature. The sheets are peeled from the mats and packed in bundles of ten for sale. This product is called hoshi-nori, which distinguishes it from yaki-nori, which is toasted. Toasted nori is nori pre-toasted and sold in sealed packages; in use it may be brushed with a mixture of soy sauce, sugar, sake and seasonings. Nori is used mainly as a luxury food. It is often wrapped around the rice ball of sushi, a typical Japanese food consisting of a small handful of boiled rice with a slice of raw fish on the top. After a short baking (slight toasting or baking brings out the flavour), nori can be cut into small pieces and sprinkled over boiled rice or noodles. It can be incorporated into soy sauce and boiled down to give an appetising luxury sauce. It is also used as a raw material for jam and wine. In China it is mostly used in soups and for seasoning fried foods. In the Republic of Korea it has similar uses to Japan, except that a popular snack with beer is hoshi-nori that has been quickly fried in a pan with a little oil. The distribution and marketing chain for nori and other Japanese seaweeds is illustrated in Figure 49. Dried nori is in constant oversupply in Japan and producers and dealers are trying to encourage its use in United States of America and other countries. Production and markets in China are expanding, although the quality of the product is not always as good as that from the Republic of Korea and Japan. Good quality nori is in demand in the Republic of Korea. These two green seaweed genera are now cultivated in Japan. Enteromorpha cultivation has also been attempted in the Republic of Korea but with limited success. Monostroma latissimum occurs naturally in the bays and gulfs of southern areas of Japan, usually in the upper eulittoral zone. It is cultivated in shallow, calm waters, such as are found in bays and estuaries, but, like Porphyra, it can also be grown in deeper waters using floating rafts. It is a flat, leafy plant and only one cell thick. It averages 20 percent protein and has a useful vitamin and mineral content. It has a life cycle involving an alternation of generations (see Section 1.5), one generation being the familiar leafy plant, the other microscopic and approximately spherical. It is this latter generation that releases spores that germinate into the leafy plant. For cultivation, these spores are collected on rope nets by submerging the nets in areas where natural Monostroma populations grow; the spores settle on the nets as they are released by the microscopic spheres. There are other artificial ways of seeding the nets that are used if the waters around the natural populations are too muddy. The seeded nets are then placed in the bay or estuary using either of the two methods previously described for Porphyra, fixed to poles so that they are under water at high tide and exposed for about four hours at low tide, or using floating rafts in deeper water. The nets are harvested every 3-4 weeks (for the method, see below for Enteromorpha) and the growing season allows about three to four harvests. The harvested seaweed is washed well in seawater and freshwater. It can then either be processed into sheets and dried, as described for Porphyra, for sale in shops, or dried, either outside or in dryers, and then boiled with sugar, soy sauce and other ingredients to make "nori-jam". Enteromorpha prolifera and Enteromorpha intestinalis (Figure 50) are both cultivated, although the production of Monostroma is much greater. Both species are found in bays and river mouths around Japan, and are also found in many other parts of the world, including Europe and North America. It can thrive in both salt and brackish waters and is usually found at the top of the sublittoral zone. It contains about 20 percent protein, little fat, low sodium and high iron and calcium. Its vitamin B-group content is generally higher than most vegetables, and while its vitamin A is high, it is only half of that found in spinach. It was and is collected from natural sources, but careful cultivation can ensure greater uniformity and better colour (green is good, greener is better). Again the life history involves an alternation of generations, but this time both generations have the same appearance of long, tubular filaments. 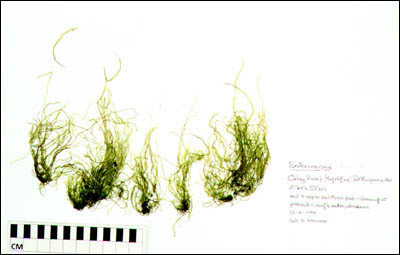 Enteromorpha intestinalis (Specimen from National Herbarium, Royal Botanic Gardens, Sydney. Collector: S. Skinner). For cultivation, rope nets are seeded with spores by submerging them in areas where Enteromorpha is growing naturally, usually attached to rocks; the better areas have calm waters and sandy bottoms. In the Republic of Korea, seed collection is from June to August and the strings or ropes are taken to culture sites in September; in Japan, seeding is done in September, and by early November young plants are visible. The nets are placed in calm bays or estuaries using either fixed poles in shallow waters or floating rafts in deeper waters. Harvesting can be done 2-3 times during the growing period, either by hand picking from the nets or by machine. As with Porphyra and Monostroma, the nets are dragged out of the water and over a cylinder equipped with cutters, mounted in a boat, and then fed back into the water. This is well illustrated in Figure 17A in Ohno and Largo (1998). Hand picking yields the best product, but is slow in comparison with machine harvesting. 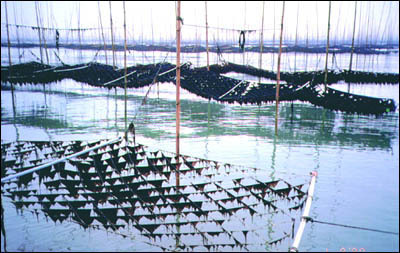 The harvested seaweed is washed in freshwater and dried in large trays. It can be lightly toasted to improve the flavour, and powdered for use as a condiment on soups and foods, or it can be crushed into small pieces and used as a garnish. "Sea lettuce" adequately describes a thin green seaweed, a species of Ulva, that appears in the mid to lower eulittoral zone. It is collected from the wild and sometimes added to the above two seaweeds as part of aonori. It has a higher protein content than the other two, but much lower vitamin content, except for niacin, which is double that of Enteromorpha. For the life cycles of Monostroma and Enteromorpha, and the methods used to seed nets and manipulate them in the sea, descriptions with useful illustrations can be found in Ohno (1993) and there is also some information in Kain (1991). For data on their nutritive values and those of Ulva, see Nisizawa (1987). Kombu is the Japanese name for the dried seaweed that is derived from a mixture of Laminaria species. These include L. longissima, L. japonica, L. angustata, L. coriacea and L. ochotensis. These are all harvested from natural sources, mainly on the northern island of Hokkaido, with about 10 percent coming from the northern shores of Honshu. The first three of the above are the main components of the harvest. The plants grow on rocks and reefs in the sublittoral zone, from 2-15 m deep. They prefer calm water at temperatures between 3° and 20°C. Haidai is the Chinese name for Laminaria japonica, a seaweed that was introduced to China accidentally from Japan in the late 1920s. Previously, China had imported all requirements from Japan and the Republic of Korea. It is now cultivated on a large scale in China. It is a large seaweed, usually 2-5 m long, but it can grow up to 10 m in favourable conditions (Figure 51). It requires water temperatures below 20°C. 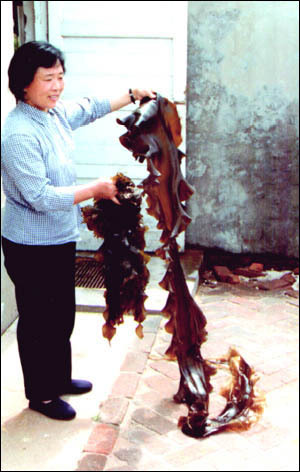 Laminaria japonica grows naturally in the Republic of Korea and is also cultivated, but on a much smaller scale; the demand is lower because Koreans prefer wakame (Undaria pinnatifida). Laminaria species contain about 10 percent protein, 2 percent fat and useful amounts of minerals and vitamins, though generally lower than those found in nori. For example, it has one-tenth the amounts of vitamins and niacin, half the amount of B1 but three times the amount of iron compared with nori. Brown seaweeds also contain iodine, which is lacking in nori and other red seaweeds. Fresh Laminaria japonica (longer piece on right) and Undaria pinnatifida. Japan has a tradition of eating kombu, going back for several centuries, and had a plentiful supply of Laminaria by harvesting from its natural beds on Hokkaido. The naturally growing plants are biennial and are ready for harvesting after 20 months. Harvesting is from June to October, from boats. Hooks of various types are attached to long poles and used to twist and break the seaweed from the rocky bottom. As demand grew in the 1960s, attempts were made to develop artificial cultivation methods, but the two-year cycle meant the costs were too high. In the 1970s, forced cultivation was introduced, reducing the cultivation period to one year, similar to the system developed in China in the early 1950s. Today, about one-third of Japan's requirements come from cultivation, with the remaining two-thirds still coming from natural resources. China had no natural sources of Laminaria but it appeared in the northern city of Dalian in 1927 with the importation of logs from Hokkaido in Japan. The Japanese, who then occupied that part of China, tried to increase the growth by their traditional method of throwing rocks into the sea. As it spread, it was harvested from these sublittoral rocks, but there had always been a strong demand for haidai in China, so importation was still necessary. 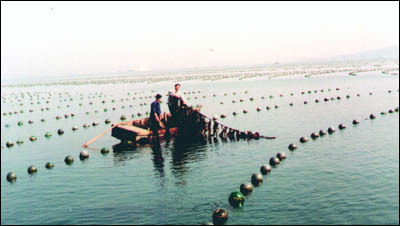 In the 1950s, China developed revolutionary techniques for its cultivation and today about 4 million tonnes of wet seaweed are harvested annually. For cultivation, Laminaria must go through its life cycle, and this involves an alternation of generations. The seaweed itself is the so-called sporophyte stage of the cycle. The spores that it sheds cannot survive above 20°C and the system developed in China overcame this problem by ensuring the spores are shed in seawater that has been cooled below 20°C. In early summer, mature seaweed is dried out slightly and plunged into cooled seawater in tanks. The drying out helps to induce the liberation of the spores. Prior to this, string is wound around frames and placed in the tank of cooled seawater so that when the spores are released, they settle on the string. The frames are then moved into shallow (20-30 cm deep) tanks in a glasshouse and kept in water at 8-10°C that is enriched with nitrogen and phosphate fertilizers. The spores on the string then develop into microscopic gametophytes, which is the alternate generation. The gametophytes mature on the string and after a few weeks they release eggs and spermatozoids that fuse together, and from this a new sporophyte grows. In one to two months, the string becomes crowded with young sporophytes (sporelings) 1-2 mm high. When the sea temperature has fallen below 20°C, the sporelings on the strings are placed in the sea for 1-2 months, until they grow to 10-15 cm. By now it is November, and the young sporelings are removed from the string and placed individually in the lay of a rope; the rope is untwisted a little, the sporeling placed between the cords and then the rope is allowed to resume its normal twist. The ropes with the young sporophytes are attached to floating rafts. There are two basic types of these rafts. The first type is the single-rope or hanging-kelp rope raft, which uses a large diameter rope about 60 m long that is kept floating using glass or plastic buoys fixed every 2-3 m. Each end of the rope is anchored to a wooden peg driven into the sea bottom. Hanging down from this rope at 50 cm intervals are the ropes with the young sporophytes attached. Each rope is from 1 to 2 m long and with a bag of stones on the end to weigh it down (Figure 52a). The floating ropes are laid out in the sea about 10 m apart, to allow the passage of a small boat between the ropes. The second type of raft is the double-raft or horizontal-line raft (Figure 52b). Here three long ropes with floats attached are laid out parallel, about 5 m apart. The short ropes holding the young sporophytes are tied across two ropes so that the sporophyte ropes are more or less horizontal (Figure 53). This arrangement means each sporophyte has about equal access to light, whereas with the vertical lines, the plants on the deeper end get less light and do not grow as well as those at the top end, a problem that can be overcome by reversing the rope halfway through the growing season. The horizontal-line raft is more resistant to water movement and therefore has less access to nutrients. Generally, the single-rope raft method is better, especially in clear water, and it has the advantage that the depth at which the plant is growing can be easily adjusted. If the water is turbid, the double raft method is used. Hanging-kelp raft (after Tseng 1987). Horizontal-line raft (after Tseng 1987). 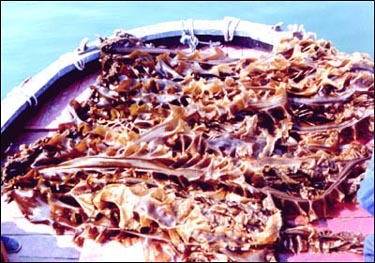 Horizontal-line raft with Laminaria japonica (Yanti, China). Harvested Laminaria japonica. 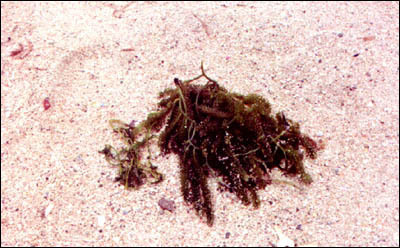 The rope (on left-hand edge of the seaweed) holding the seaweed was removed from between the two floating ropes in Figure 53. In China, the largest region for Laminaria cultivation is in the Yellow Sea, which has been found to be low in nitrogen fertilizer. Yields are increased when the floating raft areas, which are usually set out in rectangles, are sprayed with a nitrate solution using a powerful pump mounted in a boat. The plants take up the nitrate quickly and very little is lost in the sea. In Japan, the cultivation is mainly in the waters between Honshu and Hokkaido islands and fertilizing is not necessary. Harvesting is done from mid-June to early July. The kelp ropes are detached from the floating ropes and collected in small boats (Figure 54), many of which are towed in line by a motor boat. The kelp is usually laid out in the sun to dry (Figure 55), and then packed into bales. In Japan, the whole seaweed is washed thoroughly with seawater, cut into 1 m lengths, folded and dried; the product is suboshi kombu and is delivered to the local fisheries cooperative. From there it follows the type of marketing chain previously shown in Figure 49. In China, haidai is regarded as a health vegetable because of its mineral and vitamin content, especially in the north, where green vegetables are scare in winter. It is usually cooked in soups with other ingredients. In Japan, it is used in everyday food, such as a seasoned and cooked kombu that is served with herring or sliced salmon. Suboshi kombu can be treated by placing it in a boiling solution of a dye, malachite green, to give it a dark green colour, after which it is partly dried and then shredded with a plane; this is aokombu or green kombu. Kombu tea is like green kombu but shaved a second time so the shavings are like tea leaves. Other variations are used to produce different kombu types. In cooking, green kombu is boiled with meat, fish and soups. Powdered kombu is added to sauces and soups, and to rice. Green kombu and tea kombu are used to make a tea-like beverage. 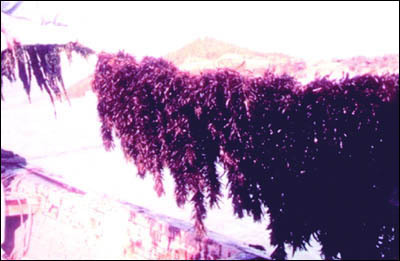 Drying Laminaria japonica (Yanti, China). For more information on the nutrients in Laminaria, see Nisizawa (1987) and Nisizawa et al. (1987). For more details of Laminaria cultivation, see Tseng (1987), Kain (1991), and Kawashima (1993). For more about different types of kombu and ways of cooking them, see Chapman and Chapman (1980: 76-78) and Nisizawa (1987). Undaria pinnatifida, a brown seaweed (Figures 51 and 56), occurs on rocky shores and bays in the temperate zones of Japan, the Republic of Korea and China. It grows on rocks and reefs in the sublittoral zone, down to about 7 m. It grows best between 5° and 15°C, and stops growing if the water temperature rises above 25°C. It has been spread, probably via ship ballast water, to France, New Zealand and Australia. Wakame has a high total dietary fibre content, higher than nori or kombu. Like the other brown seaweeds, the fat content is quite low. Air-dried wakame has a similar vitamin content to the wet seaweed and is relatively rich in the vitamin B group, especially niacin; however, processed wakame products lose most of their vitamins. Raw wakame contains appreciable amounts of essential trace elements such as manganese, copper, cobalt, iron, nickel and zinc, similar to kombu and hiziki. Undaria is an annual plant with a life cycle similar to Laminaria. It has an alternation of generations with the large seaweed as the sporophyte and a microscopic gametophyte as the alternate generation. Some wild material is collected and used locally, but all the commercial products are from cultivated plants. Cultivation methods are very similar to those used for Laminaria, although some of the temperature tolerances are different. The Republic of Korea is the largest producer of wakame. There, seeding starts in April; string is wound around frames and these are immersed in tanks. Fresh, mature plants (sporophytes) are air-dried in the shade for about an hour and then immersed in the tanks so spores are released and settle on the strings. The tanks are exposed to natural light and the seawater in the tanks is changed monthly; the water temperature must be kept below 25°C or the gametophytes may die. The gametophytes mature, fertilized eggs form on the strings and develop into young sporophytes. During September-October the sea water drops below 23°C and the frames or strings are moved to protected intermediate culture areas so that the young plants can adapt to open seawater conditions. Undaria pinnatifida, dried specimen (China). Once the young plants are 1-2 cm long, the strings are removed from the frames and wound around a rope that is suspended by floats and anchored to the bottom at each end. However, a variation from the Laminaria cultivation is that the rope long-lines are suspended 2-3 m below the surface. In sheltered bays, the ropes are placed 10 m apart; in open waters, where there is more movement, the single ropes are assembled into a grid pattern using connecting ropes to hold the long-lines about 2 m apart. Harvesting is in two stages. First the plants are thinned out by cutting them off at a point close to the rope. This is done by pulling the rope over the edge of a boat, cutting and dragging the plant into the boat. The remaining plants on the rope have plenty of space and continue to grow. Harvesting finishes in April. In Japan, the seeded strings are often cut into small lengths and inserted in the twist of a rope that is then hung vertically from a floating rope, much the same as is done with Laminaria. Harvesting in southern Japan is from March to May, but around Hokkaido it is from May to July. Cultivation has also been undertaken in France. Here the above methods were found to be inappropriate because the high nutrient concentrations in the water allowed a large variety of other plant and animal life (epiphytes) to grow on the frames holding the strings. The constant cleaning of the frames proved to be too expensive. Instead, the alternate generation, the gametophytes, are formed and maintained in a sterile laboratory medium. One month before out-planting the gametophytes are brought to maturation. After fertilized eggs (zygotes) are formed, the solution with the suspended zygotes is sprayed onto a nylon line that is wound around a frame. The zygotes germinate and young sporophytes begin to grow on the frames, which are free of epiphytes. The sporophytes are out-planted on floating ropes in the usual way. After harvesting, the plants are washed with seawater, then freshwater, the central midrib is removed and the pieces are dried in the sun or a hot air dryer; this is suboshi wakame. However, this product often fades during storage because various enzymes are still active. 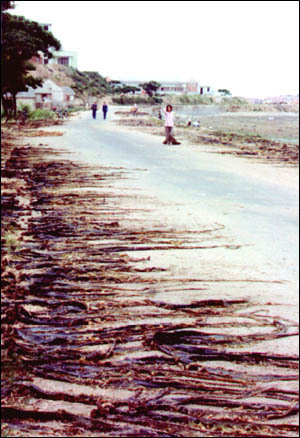 To overcome this, another process can be used in which the fresh seaweed is mixed with ash from wood or straw, spread on the ground for 2-3 days, then placed in a plastic bag in the dark. The alkalinity of the ash inactivates the enzymes. The plants are washed with seawater, then freshwater to remove the salt and ash, the midrib is removed and the pieces are dried. This is haiboshi wakame and it keeps its deep green colour for a long time. Blanched and salted wakame is the major wakame product. Fresh wakame is plunged into water at 80°C for 1 minute and cooled quickly in cold water. About 30 kg of salt per 100 kg of seaweed are mixed and stored for 24 hours. This dehydrates the wakame; excess water is removed and the seaweed stored at -10°C. When ready for packaging, it is taken from storage, the midribs are removed and the pieces placed in plastic bags for sale. It is a fresh green colour and can be preserved for long periods when stored at low temperatures. Cut wakame is a very convenient form, used for various instant foods such as noodles and soups. It is one of the most popular dried wakame products. It is made from blanched and salted wakame which is washed with freshwater to remove salt, cut into small pieces, dried in a flow-through dryer and passed through sieves to sort the different sized pieces. It has a long storage life and is a fresh green colour when rehydrated. In the Republic of Korea, wakame is enjoyed as an ingredient in soybean and other soups, as well as vinegared seaweed salads. In recent times there has been an overproduction of wakame and this has led to increased marketing efforts through the introduction of new products, such as seaweed salad, pre-cooked wakame, powdered wakame for use as a condiment and further expansion of the uses of cut, dried wakame. Wakame is more popular in the Republic of Korea than in Japan, although the market in Japan has expanded. Wakame is traditionally regarded as a luxury food in both countries, although overproduction has led to reduced prices in recent times. The Republic of Korea produces ten times more Undaria than Laminaria; it produces four times more Undaria than Japan. Production in China has apparently increased, as has its exports to Japan. In 2001, the Chinese seaweed industry agreed to reduce exports of wakame to Japan, beginning in April 2002. Japanese wakame producers agreed to support Chinese seaweed growers in finding other overseas markets and expanding demand in China. Japan imported 180 000 tonnes of wakame from China from mid-1999 to mid-2000, a 2.4-fold increase from four years earlier. Production in Japan halved during that one year period. For further detail on the nutrients in Undaria, see Nisizawa (1987) and Nisizawa et al. (1987). For more information about the cultivation of Undaria in the Republic of Korea, see Sohn and Kain (1989), Kain (1991) and Sohn (1998). For cultivation in Japan, see Ohno and Matsuoka (1993). For details of the cultivation method used in France see Kaas (1998). Methods of processing raw Undaria into marketable products are discussed in Nisizawa et al. (1987) and Yamanaka and Akiyama (1993). 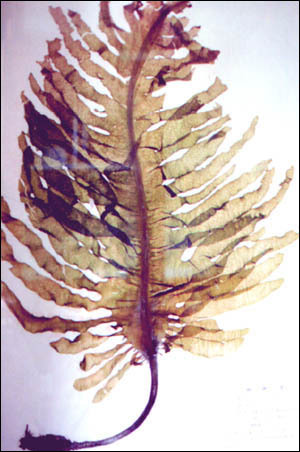 Hizikia fusiforme is a brown seaweed with a finer frond (leaf) structure (Figure 57) than wakame and kombu. It is collected from the wild in Japan and cultivated in the Republic of Korea, grows at the bottom of the eulittoral and top of the sublittoral zones, and is on the southern shore of Hokkaido, all around Honshu, on the Korean peninsula and most coasts of the China Sea. About 90 percent of the Republic of Korea production is processed and exported to Japan. The protein, fat, carbohydrate and vitamin contents are similar to those found in kombu, although most of the vitamins are destroyed in the processing of the raw seaweed. The iron, copper and manganese contents are relatively high, certainly higher than in kombu. Like most brown seaweeds, its fat content is low (1.5 percent) but 20-25 percent of the fatty acid is eicosapentaenoic acid (EPA). Some is collected from the wild, but this has decreased as cultivation has grown. For example, in 1990 in the Republic of Korea, 10 000 wet tonnes was collected from the wild and 20 000 wet tonnes was cultivated, but by 1995 these amounts had changed to 6 000 and 37 000 wet tonnes, respectively. However, for cultivation there are still problems in artificial seed production, so instead, young fronds are collected from the natural beds and 3-4 are inserted in a rope at 10 cm intervals. Seeding ropes are attached to the main cultivation rope (Figure 58), which is kept at a depth of 2-3 m using flotation buoys along the rope and anchoring it to the seabed at each end - as described previously for Undaria. Cultivation is from November to May, mainly to avoid a clash with activities connected with wakame cultivation. Harvesting is in May-June. More convenient methods of farming are being tried, including vegetative reproduction. After harvesting, it is washed with seawater (Figure 59) and dried in the sun (Figure 60). However, Hizikia is a very dark colour and contains higher than usual amounts of a pigment, phlorotannin, that gives it an astringent, bitter taste. Further processing involves boiling in water for 4-5 hours with another brown seaweed added, Eisenia bicyclis or Ecklonia cava. Boiling removes some of the pigment from Hizikia and it has been found that the addition of Eisenia or Ecklonia provides it with replacement colour. After boiling, the seaweed is steamed for 4-5 hours to remove the phlorotannins. Then it is cut into short pieces and sun-dried. The product is called hoshi hiziki. It is sold packaged in dried, black, brittle pieces that are soaked for 10-15 minutes before use. Typically it is cooked in stir fries, with fried bean curd and vegetables such as carrot, or it may be simmered with other vegetables. Hizikia fusiformis, mature plants from cultivation. Hizikia fusiformis. The seeding rope (white) was attached to the main rope when the seedlings were small. Sun-dried hiziki is collected at local cooperatives and sold by auction to wholesalers, who later sell to processors. They prepare the hoshi hiziki by the boiling and steaming process and package it for retail sale. More detailed information about the nutritive value of Hizikia is available in Nisizawa (1987) and Nisizawa et al. (1987). Cultivation is described in Sohn (1998), with useful illustrations, and in Sohn (1999). Limited processing information is found in Nisizawa (1987), Nisizawa et al. (1987) and Sohn (1998). Mozuku (Cladosiphon okamuranus) is a brown seaweed that is harvested from natural populations in the more tropical climate of the southern islands of Japan (Kagoshima and Okinawa Prefectures). Cladosiphon grows in the sublittoral, mainly at depths of 1-3 m. In the 5-6 months from late October to April it grows from 1-2 cm to its full size of20-30 cm. It prefers reef flats in calm water, although a moderate water current is needed to supply sufficient nutrients. 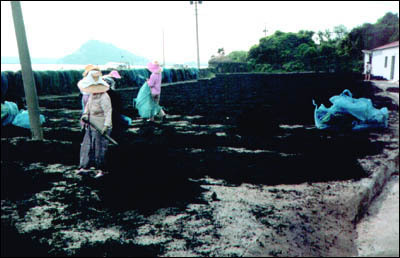 Washing Hizikia fusiformis (Cheju Island, the Republic of Korea). Sun drying Hizikia fusiformis (Cheju Island, the Republic of Korea). Its life history involves an alternation of generations, with the seaweed being the sporophyte, while the alternate generation, the gametophyte, are microscopic plants. Cultivation involves collecting spores from the sporophytes and storing them in transparent polycarbonate tanks during summer. In autumn, seed nets are prepared and transferred to a nursery ground, preferably seagrass beds or similar sea beds with moderate currents. When young sporophytes have grown to 2-5 cm, the nets are moved to the main cultivation sites. These have a water depth of up to 3 m at low tide and the nets are placed 30-40 cm above the bottom. The plants are harvested after about 90 days, when they have grown to 30 cm. Harvesting is done by divers using a suction pump that draws the seaweed up and into a floating basket beside the attending boat. The harvested seaweed must be protected from sunlight. Processing for market involves cleaning and salting with 20-25 percent salt. It is stored to dehydrate for about 15 days, drained and sold in wet, salted form in packages ranging from 250 g to 18 kg. After washing to remove the salt, it is used as a fresh vegetable, eaten with soy sauce and in seaweed salads. Due to increasing demand, cultivation was started around Okinawa Island in the 1980s. By 1995, production was 10 000 wet tonne/year and there was an oversupply. It has also been cultivated on the islands of Tonga in the Pacific, looking to an export market in Japan, but the oversupply there has stifled progress. A full explanation of the life cycle and cultivation method is available in Toma (1993). There are many species of the genus Caulerpa, but Caulerpa lentillifera and C. racemosa are the two most popular edible ones. Both have a grape-like appearance and are used in fresh salads. They are commonly found on sandy or muddy sea bottoms in shallow protected areas. The pond cultivation of C. lentillifera has been very successful on Mactan Island, Cebu, in the central Philippines, with markets in Cebu and Manila and some exports to Japan. About 400 ha of ponds are under cultivation, producing 12-15 tonnes of fresh seaweed per hectare per year. C. lentillifera (Figure 61) is the species best adapted to pond culture, although some strains of C. racemosa also give good yields. C. lentillifera is sensitive to changes of salinity, so pond areas must be placed away from any freshwater sources, and in the wet season in the Philippines surface drains are placed around the ponds to remove freshwater. The seaweed can tolerate a salinity range of 30-35 parts per thousand. Successful cultivation depends on good water management and the ponds must be designed so that tidal flows can be used to change the water in the ponds every second day. Water temperature can range between 25° and 30°C. Pond depth should be about 0.5 m and areas of about 0.5 ha are usual. Planting is done by hand; about 100 g lots are pushed into the soft bottom at 0.5-1 m intervals. Sometimes broadcasting is used but this is not as efficient, the plants are loose on the bottom and can be moved by water motion induced by wind action on the surface. Key factors to control during growth are water exchange, weeding of other species of seaweed that would otherwise compete with the Caulerpa, and fertilization if the plants appear unhealthy or pale green to yellow in colour. Harvesting can commence about two months after the first planting; the seaweed is pulled out of the muddy bottom, but about 25 percent of the plants are left as seed for the next harvest. Depending on growth rates, harvesting can then be done every two weeks. The harvested plants are washed thoroughly in seawater to remove all sand and mud, then inspected, sorted and placed in 100-200 g packages; these will stay fresh for 7 days if chilled and kept moist. For local consumption, or air freight to Metro Manila, the seaweed may be packed in baskets lined with banana leaves; 20-30 kg of seaweed is placed on the leaves, the basket is topped with more banana leaves and covered with a plastic sack that is then fixed to the basket. A full description of pond culture of Caulerpa lentillifera and an analysis of the economics of a one-hectare farm can be found in Trono and Ganzon-Fortes (1988). However, that reference is out of print and may be difficult to locate. Other useful descriptions of the details of pond culture are in Trono and Toma (1993) and Trono (1998). Dulse, a red algae with leathery fronds (leaves) (Figure 62), is found in the eulittoral zone and sometimes the upper sublittoral. It is collected by hand by harvesters plucking it from the rocks at low tide. It is perennial and when either plucked or cut, new growth appears from the edge of the previous season's leaf. It is harvested mainly in Ireland and the shores of the Bay of Fundy in eastern Canada, and is especially abundant around Grand Manan Island, situated in the Bay of Fundy, in a line with the Canadian-United States of America border between New Brunswick and Maine. The harvest season here is from mid-May to mid-October. After picking, the seaweed is laid out to sun dry for 6-8 hours; if the weather is not suitable, it can be stored in seawater for a few days, but it soon deteriorates. Whole dulse is packed for sale in plastic bags, 50 g per bag. Inferior dulse, usually because of poor drying, is broken into flakes or ground into powder for use as a seasoning; sometimes it is added to corn chips. In Nova Scotia and Maine, dried dulse is often served as a salty cocktail snack and bar owners often offer it free - it induces thirst. Dulse, Palmaria palmata. The smallest division on the scale is 1 mm, the large divisions are 1 cm. In Ireland, it is sold in packages and looks like dark-red bundles of flat leaves. It is eaten raw in Ireland, like chewing tobacco, or is cooked with potatoes, in soups and fish dishes. One company in Northern Ireland is promoting its sale through pubs as a chewy, salty snack food, and through fruit and vegetable markets. Dulse is a good source of minerals, being very high in iron and containing all the trace elements needed in human nutrition. Its vitamin content is also much higher than a vegetable such as spinach. In Canada, one company has cultivated it in land-based systems (tanks) and promotes it as a sea vegetable with the trade name "Sea Parsley". It is a variant of normal dulse plants, but with small frilly outgrowths from the normally flat plant. It was found by staff at the National Research Council of Canada's laboratories in Halifax, Nova Scotia, among samples from a commercial dulse harvester. For more information, go to www.oceanproduce.com. For those interested in some background information and opinions on why the North American dulse industry has not prospered, see Chopin (1998). Chondrus crispus has already been discussed as a source of carrageenan, in Sections 6.2 to 6.4. Irish Moss has a long history of use in foods in Ireland and some parts of Europe. It is not eaten as such, but used for its thickening powers when boiled in water, a result of its carrageenan content. One example is its use in making blancmange, a traditional vanilla-flavoured pudding. In eastern Canada, a company is cultivating a strain of Chondrus crispus and marketing it in Japan as hana nori, a yellow seaweed that resembles another traditional Japanese seaweed that is in limited supply from natural resources because of overharvesting and pollution. First introduced to the Japanese market in 1996, the dried product, to be reconstituted by the user, was reported to be selling well at the end of 1999, with forecasts of a market valued at tens of millions of US dollars. It is used in seaweed salads, sashimi garnishes and as a soup ingredient. This large brown kelp grows in the upper limit of the sublittoral zone. It has a wide distribution in cold waters and does not survive above 16°C. It is found in areas such as Ireland, Scotland (United Kingdom), Iceland, Brittany (France), Norway, Nova Scotia (Canada), Sakhalin (Russia) and northern Hokkaido (Japan). In Ireland it grows up to 4 m in length and favours wave-exposed rocky reefs all around the Irish coast. Eaten in Ireland, Scotland (United Kingdom) and Iceland either fresh or cooked, it is said to have the best protein among the kelps and is also rich in trace metals and vitamins, especially niacin. It is usually collected from the wild and eaten by local people, and while it has been successfully cultivated, this has not been extended to a commercial scale. Gracilaria species have already been discussed as sources of agar, in Sections 2.2 and 2.3. Fresh Gracilaria has been collected and sold as a salad vegetable in Hawaii (United States of America) for several decades. The mixture of ethnic groups in Hawaii (Hawaiians, Filipinos, Koreans, Japanese, Chinese) creates an unusual demand and supply has at times been limited by the stocks available from natural sources. Now it is being successfully cultivated in Hawaii using an aerated tank system, producing up to 6 tonnes fresh weight per week. Limu manauea and limu ogo are both sold as fresh vegetables, the latter usually mixed with raw fish. In Indonesia, Malaysia, the Philippines and Viet Nam, species of Gracilaria are collected by coastal people for food. In southern Thailand, an education programme was undertaken to show people how it could be used to make jellies by boiling and making use of the extracted agar. 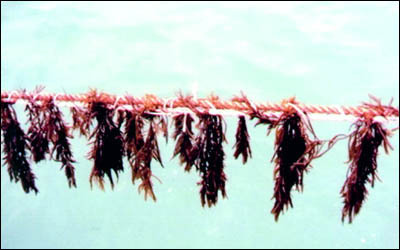 In the West Indies, Gracilaria is sold in markets as "sea moss"; it is reputed to have aphrodisiac properties and is also used as a base for a non-alcoholic drink. It has been successfully cultivated for this purpose in St Lucia and adjacent islands. In Chile, the demand for edible seaweeds has increased and Callophyllis variegata ("carola") is one of the most popular. Its consumption has risen from zero in 1995 to 84 wet tonnes in 1999. 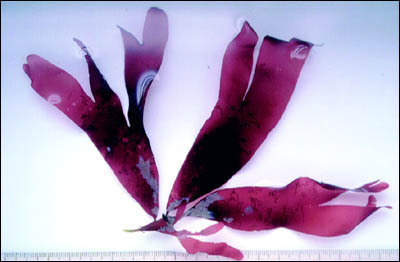 This red seaweed has a high commercial value but knowledge of its biology is restricted. In 1997, a new research project was funded, which should result in recommendations for the management of the natural resources and opportunities for cultivation. The seaweeds eaten in large quantities in China, the Republic of Korea and Japan (nori, kombu nad wakame) are all in a state of full supply, if not oversupply, in those countries. Nori producers in Japan are looking for exports to United States of America and other countries to absorb their surplus production. This, taken with the experiences of the two companies that attempted nori production in United States of America, means it would not be advisable to invest in new production facilities for nori in the near future. Certainly any prospective investors in developed countries would first need to secure rights to all the cultivation areas they propose to use. Those marketing wakame and other edible seaweeds in Europe, and France in particular, have shown that patience is needed to gain acceptance. However, the oversupply of wakame in the Republic of Korea has shown how new innovative products can expand a market. Similarly, there is something to be learned from the success of the two Canadian ventures, Sea Parsley and hana nori. Both are new products from seaweeds that have been accepted as human food for many decades. The success of their investors reflects both their ability to identify and exploit niche markets and the expertise to cultivate a consistent product. The venture in Hawaii illustrates another approach that can be taken. Here there was an established market for fresh seaweeds but an unreliable supply from natural resources. By investing in the equipment and expertise for cultivation, a successful operation producing fresh edible seaweeds has been established. The Philippines experience with Caulerpa cultivation as a fresh vegetable is another illustration of using cultivation to widen a market first established from wild seaweed; it is surprising that this kind of enterprise has not been copied in other tropical countries. Innovation, cultivation and niche markets: the combination of these three may lead to greater success for future investors, rather than attempts to break into the large markets for nori, kombu and wakame. Finally, some useful ideas from D. Myslabodski (Great Sea Vegetables, United States of America. pers. comm.). Not everyone will jump at the opportunity of having a plate of Caulerpa with their salad or having dulse as a snack. He suggests a different approach to the use of seaweeds in human food: "sea farina". This is a food grade seaweed meal (ground dried seaweed) with a particle or mesh size dependent on the final application: fine for baking, coarser for use as salt substitute or condiment. This could be made on a small or large scale. There is a long list of sea plants that have been traditional sources of human food around the world and this information could be used as a reference for collection and cultivation. What would be the health benefits to people in developing countries if just 3 percent sea farina were added to the tortillas, pitas and breads of the world? Is there a market in developed countries for such a "natural" and "organically grown" additive to the normal diet? Properly dried sea vegetables and sea farina are stable for months, perhaps longer. They do not need to be frozen or refrigerated, and sea farina is very compact and so easy to transport. A last word from Myslabodski and others in the food business. In the English language we have done ourselves a disservice calling it "seaweed": weeds are something we do not want, seaweed implies something negative about the product. When trying to convince others to eat it, "sea plants" or "sea vegetables" may be more appropriate words to describe it.